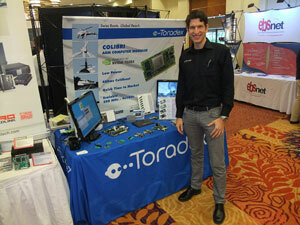 Toradex attracted the crowds at the RTECC shows in Seattle, USA and Vancouver, Canada earlier this month. The star of the show was a demonstration of our ultra-fast booting Colibri Computer Modules – a video of this demo can be found here. We exhibited the brand new Colibri T30 module which features an Nvidia Tegra 3 chip with a Quad Core Cortex A9. Also on display, the Nvidia UI composer showcased a way to generate high quality 3D user interfaces independent of an operating system. We demonstrated the Cloud Library at the two events. We now look forward to welcoming you to sps ipc drives in Nuremberg, Germany, on November 27-29 2012. Have you arranged your ticket?